Perfect! Secluded Mid-Century Compound. 3 Beds/3 Baths Views! HOT-TUB! FIRE-PIT! Check out all my 100+ reviews! Why the gushing reviews? For starters, there’s the dreamy pool/hot-tub & fire pit front yard area with amazing close-up mountain views. Then, there’s that incredible decor both inside and out highlighting only the best of mid-century furniture and plain-air art collection. 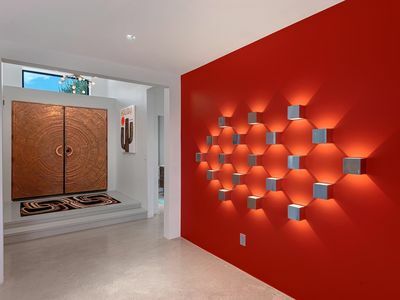 Surely, the ideal location in South Palm Springs, has something to do with it, too; the home is tucked between Deepwell and Warm Sands, putting you just a short walk or drive from , the downtown galleries, shops and Palm Springs restaurants. Finally, there are the sumptuous en-suite bedrooms, private and serene garden patio areas (8 in total!) 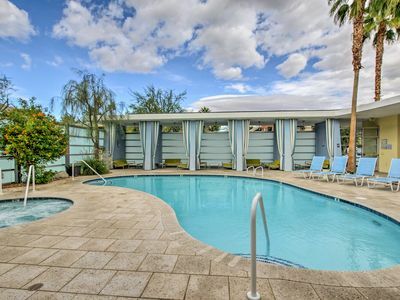 guaranteeing that however you spend your Palm Springs days, your nights will be spent in pure star-gazing luxury. A true tranquil escape from the outside world. 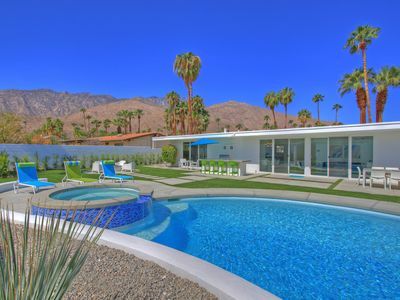 This home is described as an idyllic home away from home, where it's in the top vacation rentals in Palm Springs, it's the winner of a Certificate of Excellence, and nearly 100% of its 100+ reviews are five-star. Guests wistfully recall afternoons cruising on complimentary bikes, lounging afternoons away at the pool or admiring the lovely and verdant gardens and 8 private patios. If you want to step into the spotlight, of course, you’re walking distance from town. But why would you leave, when the living’s so easy? 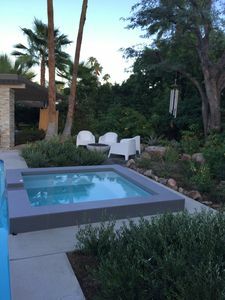 Newly remodeled (in 2015) 7 foot deep pool/ HOT TUB and FIRE-PIT adding to the already amazing house, gardens and patios offering magnificent views of the surrounding mountains. NO ELECTRICAL WIRES. NO AIRPORT NOISE. You'd be forgiven for spending your whole time here in a lazy haze. Start your day w/ coffee out by the pool before a stroll through the gardens to find a secluded spot. If that sounds a bit too chilled out, head downtown to eat, shop, gamble or explore. There are plenty of ways to while away the sun-soaked hours at this heavenly hideaway. The perfect place to de-compresse from the everyday world. You’ll wonder whether this home grew out of the same seeds that sprouted the surrounding tranquil and verdent gardens. 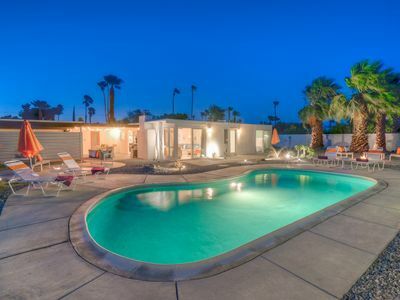 The perfect Palm Springs location. Perfect views. Custom furniture both indoors and out. Perfect Paul Truesdale designed home. 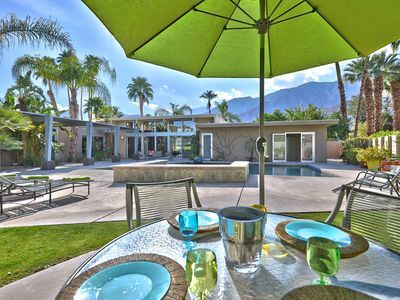 The perfect Palm Springs home! (Owner has two other vacation rentals in Long Beach, CA: VRBO listing #280444 and Puerto Vallarta: VRBO listing #835936). Rolling gate installed from the street into the auto court and driveway area for greater security and increased privacy. Plus, a call box that rings into the home. ALSO, a pedestrian gate into pool area from auto court. A true private resort compound. Walled, hedged and gated with breathtaking views and unmatched intimacy. Total privacy and stunning surroundings. Use owners annual Pass to Joshua Tree National Park! Just 40 minutes away and a world apart! 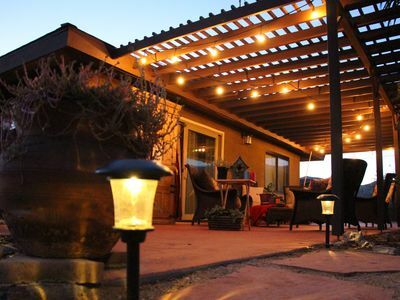 Designed for indoor/outdoor intertaining, this perfect private mid-century compound with a NEW oversized pool, an outdoor living room (perfect for watching the mountain sunsets) with plenty of covered patio space and amazing butterfly and hummingbird gardens. This front pool area is perfect for al-fresco dining, sunbathing, swimming or relaxing. Beautiful landscaped grounds with mature trees and perfect mountain views and 8 seating areas with classic (mid-century) outdoor furniture. Seating and reclining areas including four poolside chaises and two outdoor eating areas in both the front and backyard, an outdoor living room with sofa and 8 private patios all create the perfect blend of seating and outdoor dining for the perfect vacation. Private outdoor shower in pool area. Inside, you will discover a Paul Truesdale designed Mid-Century classic perfectly refined and updated in 2009 & 2010. Walls of glass in almost every room open onto the patio and pool area providing easy access and the ultimate indoor/outdoor desert experience. This seamless integration between the indoors and outdoors through multiple sets of doors brings in the natural light, warmth and cheer. 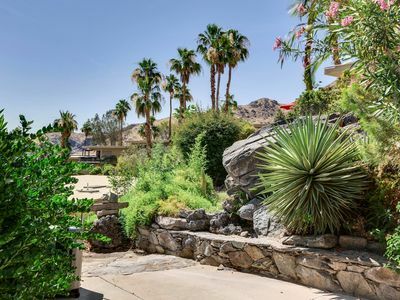 Whether throwing some shrimps on the gas barbecue, dining al fresco or just relaxing by the pool, you’ll be sure to enjoy this completely private compound (walled/hedged and gated), quiet and relaxing desert oasis. Owners extensive Plain-Air art collection includes paintings by Mark Kerkhoff and Werner Seeholtzer and Modern artwork by Chris Westergaard. Mid Century furnishings abound both inside and out. There are two separate bedroom wings allowing for plenty of privacy. The Master wing contains a large bedroom featuring a California king size bed, a 42” flat screen HDTV and a bathroom with modern dual vanities. The shower has two shower heads, three body sprays and a shower wand. Three operable windows open to the back yard. There is plenty of usable drawers, a clothing armoire and ceiling fan. The Master Bedroom also contains a stackable washer/dryer behind hidden doors. Large East facing windows overlooking the front pool area also provides access to the outside. Watch amazing desert sunrises from bed! The second wing contains a second Master Bedroom with a queen size bed, a ceiling fan and walls of glass opening onto the patio and pool area. This bedroom allows for perfect mountain views and amazing sunsets. This bedroom also has an en-suite bathroom with a limestone countertop plus a whirlpool tub and shower. An operable window looks out onto the lovely side private garden. The third guest bedroom features twin beds and an en-suite bathroom with a shower panel with multiple shower heads and body sprays. This bedroom is carpeted. A door to the private side garden area with a table and two chairs complements this twin bedroom. All 3 bedrooms have vaulted ceilings with recessed lighting, ceiling fans and outdoor access. All 3 bathrooms have all been carefully updated with contemporary cabinetry, fixtures and custom travertine flooring and all bathrooms have operable windows for fresh air. Flat screen televisions in both Master bedrooms, the Media Room and Kitchen. Each bedroom has a ceiling fan for individual comfort. The house has dual heating and air conditioning systems, dual swamp coolers as well as dual water heaters. Bedroom #2 and #3 now have instant hot water heater. All bedrooms have outdoor access. The living room has a vaulted ceiling with recessed lighting and multiple sets of glass doors opening onto the patio and pool area extending the seamless integration of the indoor/outdoor feeling. There is also a gas fire and ice fireplace surrounded by beautiful floor-to-ceiling stacked stone and a limestone hearth for warm, cozy, intimate winter nights. The living room and much of the house features slate tile floors. Off the living room is a Media Room including a 50-inch plasma TV, DVD player and built-in surround sound for the ultimate movie watching experience. Wine Refrigerator located in home theater room along with a ceiling fan. A door in the Media Room leads to a private outdoor garden with seating area. There is also the ability to separately play music throughout much of the house and the outdoor spaces with built-in speakers and volume controls in each area. Spectrum TV with speakers thoughtout the home, and wireless internet are provided. 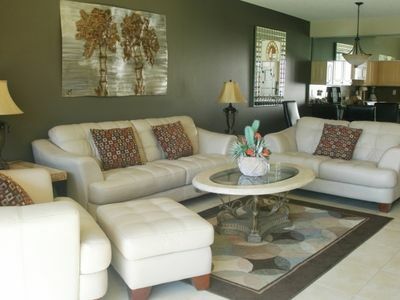 Professionally designed contemporary furnishings with Plein Air and contemporary artwork are found throughout the house. The media room is carpeted. Seperate volume controls for music are located in the Media Room, Living Room, outdoor pool area, kitchen and Master Bedroom. 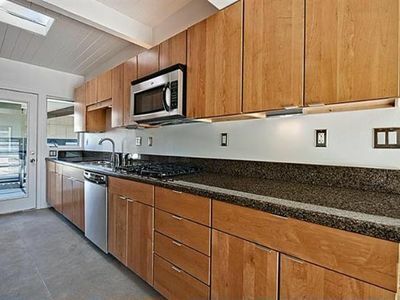 A fully-equipped kitchen was also updated in 2010. Caesarstone countertops, custom cabinetry, stainless steel appliances including a professional style 5 burner range, an Electrolux ICON French style refrigerator w/ freezer on the bottom, a BOSCH Dishwasher with three drawers and a built-in microwave. Just about everything you could possibly need is provided. All pots and pans. Large and small appliances are included as well as all dishes and silverware.Two coffee makers including a Keurig coffeemaker and a Mr. Coffee. Gas BBQ. The kitchen conveniently opens onto the indoor dining room w/ seating for 6. The dining room features a large bright french doors that open onto the rear patio with outdoor dining for 6. This backyard dining area also has a gas BBQ and beautiful covered shaded canvas 'sales'. This backyard is private. Just about everything you could possibly need is provided. There is a separate wine refrigerator in the media room. 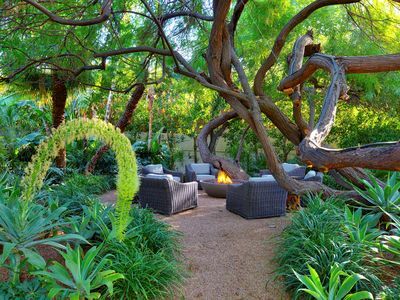 Extensive Agave Gardens with six Palo Verde trees on the side and back yards offer a prefect place to read or catch up. Mature gardens with lush butterfly and hummingbird landscaping surrounds the home. A private Plumeria Garden. Two fountains in the back bringing the sound of water throughout the home. A large Mesquite Tree is the focus of the front yard pool area, Two 50 foot palms...everything perfectly lighted with Lumineering Lighting. Automatic watering system. 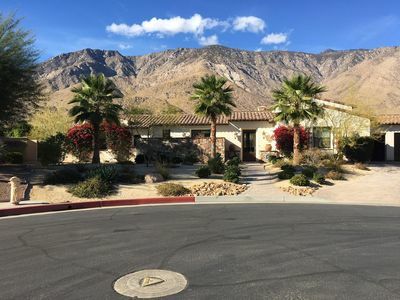 Perfectly located just a mile south of Downtown Palm Springs in the less-windy Tahquitz River Estates neighborhood and is surrounded by other single-family residences. 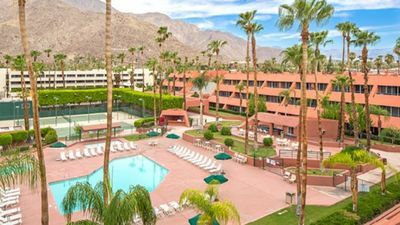 Close to everything, shopping, restaurants and nightspots of Downtown Palm Springs and the Spa Resort & Casino are just a mile away. Golfing on both public and private courses, horseback riding and numerous hiking trails are only minutes away as well. Hot air balloons located in Indio, 30 minutes away. The world-famous Palm Springs Aerial Tram and and the designer shopping of El Paseo are only 25 minutes away. Mid Century Modern, Central PS. Super fun vibe, relax, swim, enjoy yourself. Minutes Away from Downtown With Stunning Mountain Views! Private Suite with Awesome Outdoor Experience! 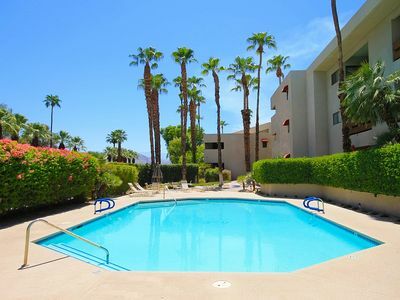 Palm Springs Condo w/ Luxe Amenities & Mtn. Views! Secluded Luxury Indian Canyon Retreat. Stunning Views. Walk to Hiking and Golf! Experience California At Marquis Villas! COACHELLA WK1 AVAILABLE! 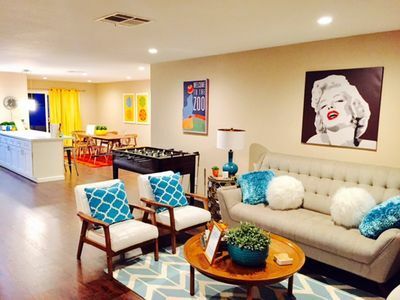 This retro futuristic house has something for everyone!